ACCES, also known as the Music In Africa Conference for Collaboration, Exchange and Showcases, is a pan-African event for music industry players to exchange ideas, discover talent and create business linkages. ACCES is held in a different African city every year attracting active music industry players from around the globe. Partners: Siemens Stiftung, Goethe-Institut, the Permanent Presidential Music Commission, Kenya Cultural Centre, ONGEA, Ketebul Music, Samro Foundation, Midem, Busara Promotions, Bayimba Festival, and WOMEX. DISCOP (content, adaptation right and project market has become Africa’s #1 destination for content production, acquisition and distribution business. 400+ up-and-coming / established producers of homegrown film, television and digital content. The 2018 Johannesburg edition of DISCOP is specifically tailored to meet the demand of a rapidly changing audiovisual landscape under the influence of a marked preference for home-grown content, the emergence of local talents, viewers’ migration to mobile screens and faster and cheaper Internet. 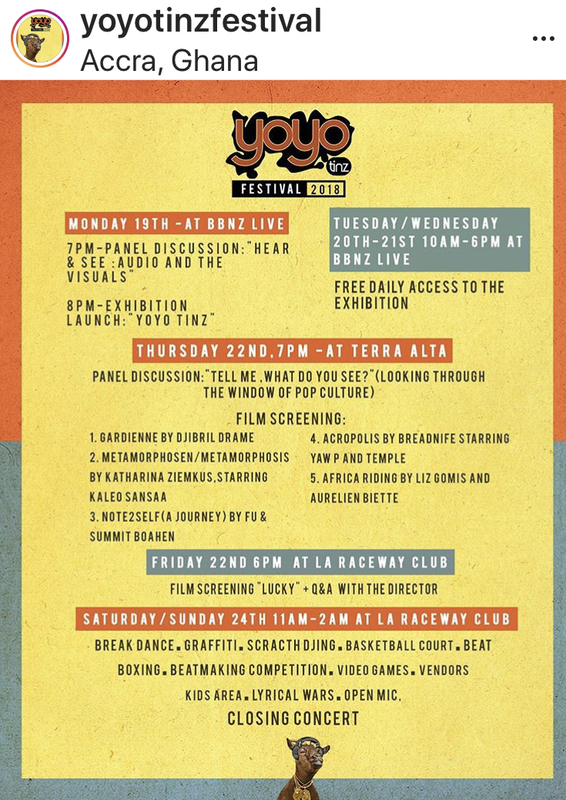 From Monday 19th to Sunday 25th November 2018, the Accra based collective yoyo tinz will invite Accra’s population to experience its very first hip hop festival. yoyo tinz is a cultural organisation aiming at promoting, documenting and archiving hip hop culture in Ghana and beyond, with a strong emphasis on sharing knowledge about the culture and the societies from which they are created. The organisation has been operating since 2013. Here is what to expect from the maiden edition of this particular GHanaian Hip Hop Festival. Rapping, DJaying, Beatboxing, Breakdancing, graffiti and urban fashion from a distinct African eye. The SHUTDOWN 18 DJ Workshop + Symposium. Register to be part of the conversation! WORKSHOP: Understand basic software creative uses, features and expansion packs for performance and production. Experience two turntable and mixer set-ups. SYMPOSIUM: Branding yourself as a DJ; Financial management and DJaying as an art. The Africa Music Business Summit will bring to the front burner vital issues affecting the music industry in Africa. Music Professionals, music executives and government officials across the continent will gather to develop a synergistic progress on the evolution in the music market, technology disruptions, and music business financing. 22 NOVEMBER from 17:00 hrs to the break of dawn ... the next day. The 5th AFRIMA (All Africa Music Awards) ceremony. Ceremony begins at 19:00 hrs. Broadcast live on DSTV / HIPTv + GOTV. The 2018 All Africa Music Awards (AFRIMA) annual calendar of programmes will be unveiled on Monday, May 21, 2018 by the African Union Commission (AUC) in collaboration with Government of the Republic of Ghana, and the International Committee of AFRIMA during a world media event and music conference scheduled for Accra, the capital city of Ghana. AFRIMA Country Director, Ghana, Mr. Francis Doku. lso participating at the event are past AFRIMA nominees and winners, music professionals and executives, creative/culture industry policy makers, members of the media industry and other award-winning recording artistes living in Ghana and in other African countries. Commenting on the event in line with government’s objective to develop sustainable tourism pivoted on Ghanaian arts and culture, Ghana’s Minister of Tourism, Arts and Culture, Hon. Catherine Afeku, said: “Arts and culture, as a sector, remains one of Africa’s greatest strengths. As well as being a source of values, identity and a sense of belonging , the creative industries have become a driver of economic growth and job creation. In agreeing to host the AFRIMA 2018 Calendar Unveiling, the Government of Ghana is motivated by the need to harness the potential of the creative sector of Ghana to promote national and regional tourism. We congratulate the African Union for lending its weight behind this laudable effort”. millennium, cultural activities contributed to 1.53% of the Gross Domestic Product (GDP) of our country. Zeroing in on music industry, it is reported with some justifiable pride that that sector alone adds approximately GH¢100 million to GDP”. the achievement of the AU policy on Africa transformation through social integration. Pan-African nature. We thus express our gratitude to the Government of the Republic of Ghana for hosting the event and call upon all musical artists to participate in the initiative by submitting their works once the call for submissions is open”. stakeholders and high-octane music concerts tagged “Turn Up Africa” which objective is to connect fans and followers of African music with their favourite Africa music stars of the traditional and contemporary genres. in Africa. The award show is usually broadcast to over eighty countries around the world. With top notch creativity, amazing performances and a fantastic artiste lineup; the 6th Annual Ghana DJ Awards which came off at the Accra International Conference Centre on Saturday, May 5 went down in books of history as one of the most exciting and and captivating events of the year! Kwaw Kesse, DJ Mic Smith, Darko Vibes, MzVee, DJ Vyrusky, Medikal, Kuami Eugene, DJ Mpesempese, DJ Nyce, DJ K Krack, Kidi, Captain Planet and a host of other top stars lighted up the stage last night with mind-blowing performances which turned the awards night into a total party time. Host Gloria Sarfo held the fort for Joselyn Dumas alongside official host Prince David Osei. Dumas had a knee injury, which made it difficult for execution of her role as host on the night. Joselyn Dumas was backstage all night during the event hoping her knee would feel better so she could get on stage. 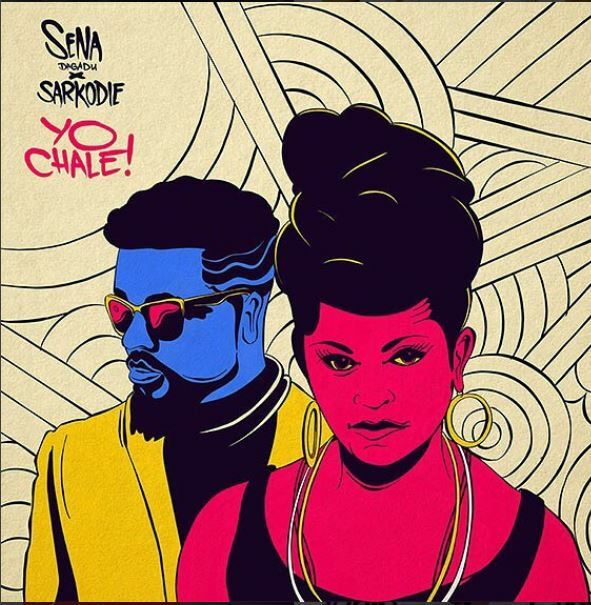 Check out the most anticipated video #YoChale - "Sena Dagadu Featuring Sarkodie"
Lyrical play here on top of a slamming beat with Africa's top rap artist guest-starring on Hungary's (... and Ghana's) most versatile rap artist, toaster, singer, songwriter's, new direction song. "Yo Chale is a vernacular Ghana term that means "hey homie, hey homeboy, hey paddy, hey friend, hey peeps etc". Recorded in Accra, Ghana and Budapest, Hungary. Is the future of music in Eastern #Africa, in its past? This should be a n interesting discussion, one not to miss. Join us at the ONGEA! 2018 - The 3rd Eastern Africa Music Summit, Thursday 15th to Sunday 18th February at The Sarit Centre Expo Hall from 12pm-10pm Daily. Entry is Free! The Music In Africa Conference For Collaborations, Exchange And Showcases, or simply ACCES, is the ideal platform for music industry players from across the continent to exchange ideas, discover new talent and accelerate the shaping of the vibrant music sector on the continent. ACCES is held in a different African city every year, attracting delegates from many countries. The event is spread over two days, offering a dynamic programme designed to benefit local participants and visiting delegates. The programme typically offers training workshops, panel discussions, presentations, live performances, networking sessions, exhibitions and visits to key music industry hubs in the host city. Wherever it is held, ACCES presents opportunities for the local industry to showcase its musical works to a diverse audience while fostering business exchange and the creation of a strong network of music professionals on the continent. ACCES is attended by influential people in African music, from festival bookers to funders, policymakers to musicians, NGOs, record labels and distributors, musicians and many more. ACCES provides the ideal platform for the local industry to engage, showcase its offerings and do business with other industries (local and global). ACCES is pan-African and accessible – it moves to a different African city every year. ACCES helps musicians to get touring opportunities. ACCES offers valuable insights into the music sector on the continent. Showcase to bookers/businesses who may open new doors for you. Meet local, regional and international professionals who are keen to do business. Be part of a sustainable network. Join an active network of music professionals on the continent. Promote your work/your business to a wider audience. to encourage growth in the African music sector. ACCES started in 2016 as a small feature on the Music In Africa Foundation’s AGM Plus programme. The AGM Plus was held in Addis Ababa, Ethiopia, and attended by delegates from more than 15 countries. The keynote address was delivered by legendary Ethio-jazz musician Mulatu Astatke. From 2017 the AGM Plus will be packaged as ACCES. The programme is implemented in English and French, with professional translation. ACCES 2017 will take place in Dakar, Senegal, on 17 and 18 November. For the 2017 programme, partners and other information visit the official website. ACCES is an initiative of the Music In Africa Foundation. It is supported by the Siemens Foundation, the Goethe-Institut, Teranga Jam Fest, the Association of Musicians of Senegal and other partners. Video - Sarkodie releases seven music video for 'Highest"
The continent of Africa's top and Ghana's consistent rap artist; Sarkodie has released six (+ one previously released) music videos to his chart-streaming full-length album called "Highest". Prepare your ears for incredible Akan Twi, Pidgin English and English lyrical cadences and wordplay. Prepare your eyes for the visuals capturing scenic areas of the African, Norh American and European continents. 3. We No Dey Fear (Feat. Jayso) - (Produced by Jayso) - Directed by Alexxa A. 4. Ur Waist ft. Flavour (Produced by Masterkraft) - Directed by Alexx A. Are you going to be in the United States of America during the last week of October 2017? Will you fly or drive to Dallas, Texas? Get ready! 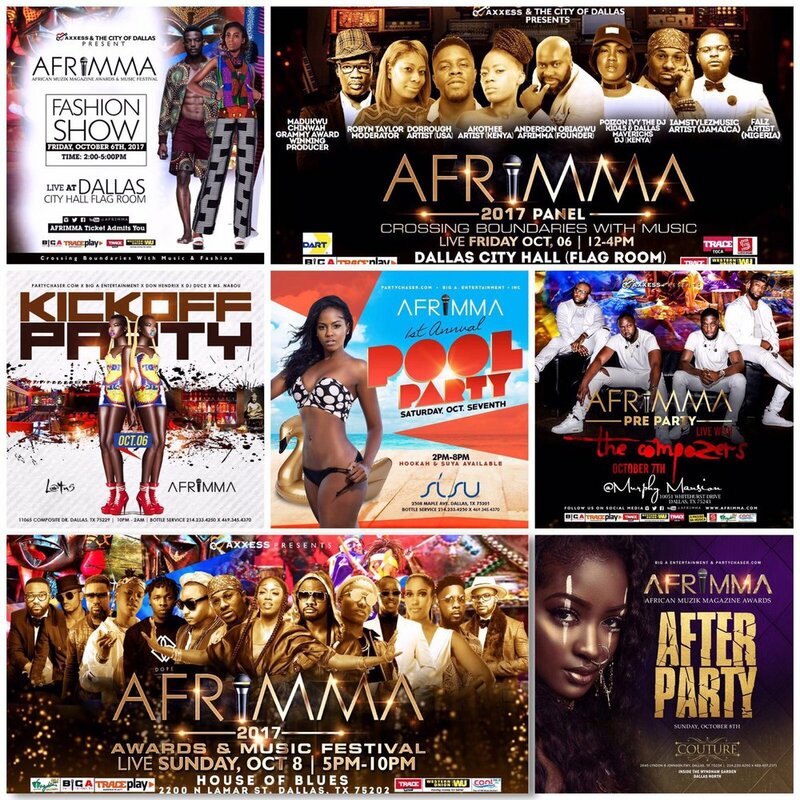 4th Annual AFRIMMA: African Muzik Magazine Awards & Music Festival on October 8 at 5 p.m.
Are You Ready for The Biggest African Music Awards in Diaspora? AFRIMMA!!! The 4th Annual African Muzik Magazine Awards and Music Festival ( AFRIMMA 2017 Awards & Music Festival ) at The Prestigious 'House of Blues' Dallas. Visit www.Afrimma.com to get your tickets now to avoid last minute scramble. Afrimma Music Panel - Friday 6th, October 2017. Afrimma Fashion Show - Friday 6th, October 2017. Afrimma Kick -off Party - Friday 6th, October 2017. Afrimma Day Party/Pool Party - Saturday 7th, October 2017. Afrimma PreParty with Compozers Band - Saturday 7th , October 2017. Afrimma Official After Party - Sunday 8th of October , 2017 . The original returns to the New York lounge performance scene. Public voting on the AFRIMA website, www.afrima.org has been opened on Monday, August 21, 2017. VOTE HERE: English + Français text. The full nominees list of 33 categories comprising of the Regional Category which covers the five African regions and the genre-based Continental Category was revealed to the media and on AFRIMA digital media platforms. From August 21 – November 11, music lovers across the continent will be empowered to vote for their favorite artistes in Regional and Continental categories during the voting period that will be ongoing for 11 weeks on the AFRIMA website. The works that were reviewed and assessed by the AUC-AFRIMA's 13-man are strictly within the year in review (August 1,2016 –July 17,2017). The public voting process is part of AFRIMA's core values, FACE-IT, which asserts that the process must exude Fairness, Authenticity, Creativity, Excellence, Integrity and Transparency. This empowerment process is part of the participation culture that the African Union Commission and AFRIMA embody. In addition, the AFRIMA Academy, comprising of music production experts and analysts, will also be involved in the open online voting process. The 2017 AFRIMA will hold from November 10 to 12 featuring a rich programme of events such as the Africa Music Business Roundtable (November 10), which garners the big music brands in the continent's music industry, to deliberate on the nurturing and packaging of the industry in a way that creates jobs and adds to the GDP of the continent. Other events are the AFRIMA Music Village (November 10), an evening of a non-stop open music festival of live performances from the African stars and nominees, with an expected audience of 20,000 people; The Main Awards Ceremony (November 12); a glittery, star-studded and world-class event with live performances and television broadcast to 84 countries on 109 television stations around the world. In partnership with the African Union Commission, AFRIMA is aimed at celebrating the rich musical heritage of the African continent. It employs the tool of music to encourage unity, cooperation, interaction, partnerships and progress in the continent. It will be broadcast live to over 84 countries around the world. The African continent's most famous Afro-pop/Afrobeat music star (by way of Nigeria) ***Yemi Alade *** is gracing the New York metro area this Saturday, 5th August. Digiwaxx + others and my Mixerpot have partnered to provide an opportunity for an exclusive discount on tickets to attend the Saturday evening, Times Square area (Manhattan) showcase. Come see the incomparable #YemiAlade at @PlayStationTheater on Saturday Aug/5/2017. Doors open at 7PM. Use this link https://www.axs.com/events/339351/yemi-alade-the-ovasabi-band-tickets/promopage/9628 and enter code YAXRB at check out! Watch ALL of her music videos here! Is your music connected to Africa or Indian Ocean nations? Is your music 100% live? Are you interested to perform next February 2018 in Zanzibar? WHEN: 8 – 11 February 2018. PLAN AHEAD NOW! Sauti za Busara 2018 will feature 40+ performances on 3 stages over 4 days, including diverse, original and live music from across the African Continent and diaspora. Artists representing music from the Arab World and Indian Ocean are also welcomed to apply. Incomplete applications or those received after the deadline will not be considered.To apply to participate, please send all documents as listed below. Artist’s profile in festival programmes, press releases, website and social media. The selection committee meets in August to finalise the line-up for Sauti za Busara 2018. All applicants will be notified of their decision before September. Artists from outside the region may be required to find their own travel sponsors. 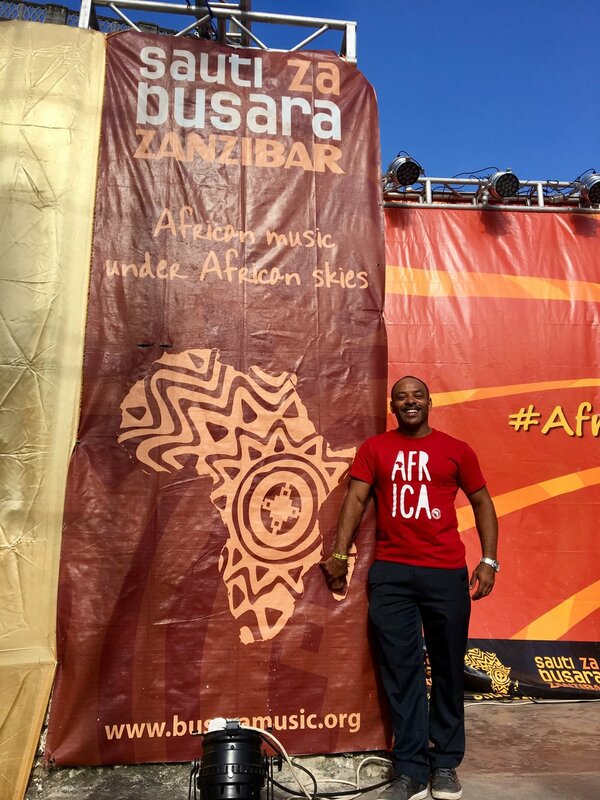 Sauti za Busara is an African music festival that is held every year in February in Zanzibar, Tanzania. It is centred in the Old Fort (Ngome Kongwe), with fringe events taking place concurrently around Stone Town - including a carnival street parade. Sauti za Busara is one of the largest music festivals in East Africa, with several hundreds of artists participating each year. It showcases a diverse and dynamic programme of exclusively African music - 100% live - and has over the years provided a valuable stage for local Swahili talent, from taarab legends like Bi Kidude and Culture Musical Club, to homegrown Tanzanian pop and hip-hop. The All Africa Music Awards, AFRIMA 2017 is officially open for entries from Artistes, Songwriters, Music/Entertainment Journalists, Video Directors, Music Producers, and DJs, from across the African Continent and Diaspora. The AFRIMA awards is celebrating excellence in musical artistry in Africa and the Diaspora, featuring 33 categories across the five regions of Africa and music genre, with a reward of 23.9 carat gold AFRIMA plated trophy. The All Africa Music Awards, AFRIMA 2017 is officially open for entries from Artistes, Songwriters, Music/Entertainment Journalists, Video Directors, Music Producers, DJs, from across the African continent and Diaspora. The AFRIMA awards is celebrating excellence in musical artistry in Africa and the Diaspora, featuring 33 categories across the five regions of Africa and music genre, with a reward of 23.9 carat gold AFRIMA plated trophy. Entries open from May 8, 2017 and closes on Monday, July 17, 2017. Eligibility: Music professionals of African origin living either on the continent or abroad are eligible. The award is open to Artistes, Songwriters, Video Directors, Music Producers and Music/Entertainment Journalists as well as unrecorded artistes. It is strongly advised that you submit your work (s) via online submission, the Entry Registration Form must be carefully and accurately completed and submitted including the relevant URL links for the digital version of the artistic work/writing in the space provided. Forms can be filled in English and French. All entries by journalists must be submitted in their original language of publication. African artistes must upload and submit their audio or video entry using download links to YouTube or SoundCloud platforms to qualify for nomination in award categories relevant to their artistic work. Works to be submitted must be produced and released to public in the year under review i.e. August 1, 2016 to July 17, 2017. You can enter a work/works in several categories as applicable but each entry registration must be done and submitted individually. Ghanaian contemporary soul / alternative singer Efya is in New York for a two hour showcase with a live band! Afrobeat Nights NYC makes its official return April 26th with DJ Tunez featuring Efya at SOB's. It is the quintessential event to indulge in rich, vibrant culture through music. This event will provide an intimate vibe with eclectic music provided by a live band. Join us as we unwind with the latest afrobeat sounds. Watch: https://youtu.be/vk_4yxkgjAI - "Skin Tight"
Video - VVIP Featuring StoneBwoy - "After Party"
Plenty of Ghanaian celebrity appearances in the video called "After Party" by veteran Ghanaian rap supergroup called VVIP. Stonebwoy opens it up and then Reggie Rockstone, Zeal and Prodigal handle the rest. Track produced by DJ Breezy of Accra and video directed by Pascal Aka. Filmed at Accra's latest five-star hotel called Kempinski. Great dapper attire by all in the video. Shout out to Hammamat at the end of the video! The All Africa Music Awards, 3rd edition, happened live on Sunday, 6th November 2016 in Lagos, Nigeria at the Convention Center Eko Hotels & Suites. There were live performances from Falz (Nigeria); VVIP (Ghana); Aramide (Nigeria); Brymo (Nigeria); Navio (Uganda); Daphne (Cameroon); Seyi Shay (Nigeria), Darey Art Alade (Nigeria) (backed by the Soweto Gospel Choir); P-Square; Diamond Platnumz (Tanzania) plus a tribute to Papa Wemba! The AFRIMA 2016 events was preceded by and African Music Business Summit roundtable then AFRIMA Music Village on Friday November, 4, 2016. This was a non-stop music concert with over 40 African artistes performing live at the Waterfront, Bar Beach, Victoria Island, Lagos Nigeria. The All Africa Music Awards is tailored to recognize and reward those who have given African music the most creative competitive edge in the global market within the year under review. Over 154 nominees are campaigning for votes from the public for the various categories of awards. It is a partnership with the African Union Commission. The AU (African Union) breaks up Africa into five regions. AFRIMA has followed that template to create the award categories in each of these five regions. Eastern, Southern, Central, Northern and Western. AFRIMA went further and created categories for overall CONTINENT of AFRICA (continental) awards. The criteria for these categories are listed here. 16. SongWriter of the Year – Navio Uganda) + Unique for "Njogereza"
29. Album of the Year – Ahmed Soultan (Morocco) for "Music Has no Boundaries"
These other awards were specially created for recognizing talent in other ways from the African continent. Rab Bakari is attending WOMEX [World Music Expo] 2016 in Santiago de Compostela; in the Galacia region of Spain. WOMEX is an international networking platform for the world music industry. The annual five-day event comprises a bustling Trade Fair, Showcase Festival, Conference, and Film programme, as well as festive Opening and Award ceremonies. Twenty-one WOMEX editions have affirmed the value of networking across borders, be they musical, political, cultural or commercial. Since 1994, WOMEX has been travelling all across Europe from Berlin (1994), via Brussels (1995), Marseille (1997), Stockholm (1998), Berlin (1999 + 2000), Rotterdam (2001), Essen (2002 + 2004), Newcastle (2005), Sevilla (2003 + 2006 - 2008), Copenhagen (2009-2011), Thessaloniki (2012) to Cardiff (2013), Santiago de Compostela (2014) and Budapest (2015). The 22nd edition of WOMEX takes place from Wednesday, 19 to Sunday, 23 October 2016. The grand event took place in Downtiwn Dallas, Texas USA. Best African Dancer – Winner Brenda Derry (Cameroon) iliwaniwa this award and also the Diamond Dancer Tanzanian Platnumz called Mose Iyobo. Best collaboration – Reggae Blues (Harrysong, Kcee) (Nigeria). Crossing boundaries with Music – Wizkid (Nigeria).